A longtime resident of Western Pennsylvania, Dr. Lohr returned to the area after completing his veterinary training to be closer to his family and their pets. His decision to become a veterinarian was made one evening when he was very young and his family had difficulty locating after-hours emergency care for one of their cats named Snowball. He knew that becoming a veterinarian would mean that emergency care was always available for his family pets, regardless of the hour. He obtained an undergraduate degree in Biology at Clarion University of Pennsylvania in 1997 and graduated from the School of Veterinary Medicine of the University of Pennsylvania in 2002. After several years in general practice, he joined the Beaver County Humane Society as their first staff veterinarian and served as their medical director for eight years. 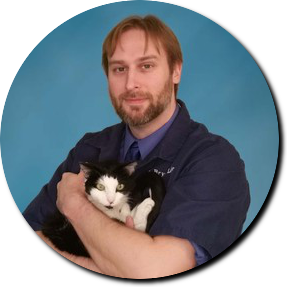 Dr. Lohr’s clinical interests are many, and include medicine, shelter medicine and surgery. He has undertaken additional continuing education training courses in orthopedic surgery, focused on external skeletal fixation, at Iowa State College of Veterinary Medicine; as well as in oral surgery at Ohio Veterinary Dental Service. In 2013, he received a Certificate in Shelter Medicine following the successful completion of a post-doctoral program through Purdue University School of Veterinary Medicine. Outside of the office, Dr. Lohr enjoys outdoor activities such as rollerblading, hiking, and kayaking. He frequently works with rescue organizations to reduce over-population and suffering of homeless animals. He also enjoys spending time with his cats, honing their skills in chasing insects and catching sunbeams.